This week, we’re so excited to have Charlotte Skiba of Charlotte Interiors on the blog! Charlotte is a Halifax based interior decorator and home stager, and she’s here to share the top lighting trends for 2018. With a new year comes new design trends and every year something seems to change at least slightly from the year before. Old trends become new again, current trends evolve, and completely new trends emerge. This holds true through fashion and design and especially lighting. So instead of leaving it up to you to figure out, I’ve compiled a list of the latest lighting trends for 2018. Gold has definitely been making a huge comeback, but this time it’s coming back in a softer hue than the old brassy gold that was popular in the 90s. This finish provides some warmth to your design and can be paired with other metals, such as nickel and aged brass (both warmer metals). 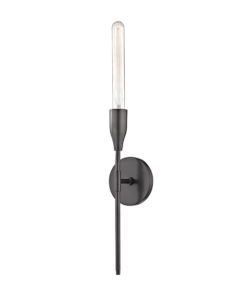 The Karin wall sconce from Mitzi by Hudson Valley is perfect for bathroom vanity lighting. Pair two of these with a black or nickel round mirror and a soft gold faucet to create a beautiful bathroom. Midcentury Modern is having a big moment in design and lighting is no exception. Clean lines and round shades are very popular this year. The Ashleigh light from Mitzi by Hudson Valley is the perfect addition to any midcentury modern living room. Large fixtures that make a statement are very popular right now. 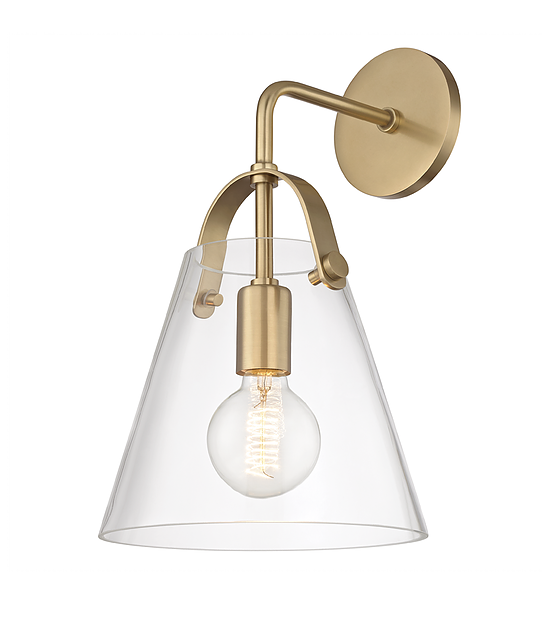 I’m seeing most of these larger fixtures showing up as kitchen island pendants and they really anchor the space. 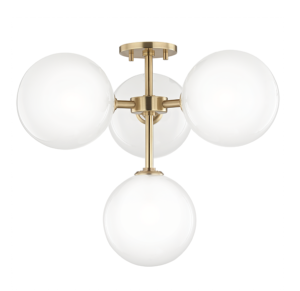 Typically, on a large island you would see three medium size pendants, but what we’re seeing now is that number changing to two and those pendants being fairly significant in size, almost like something you would see over a dining room table. 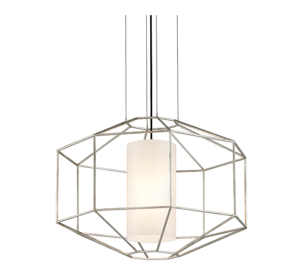 The Silhouette pendant by Troy Lighting comes in at a width of 27.75” and would make a perfect statement for your kitchen island lighting. 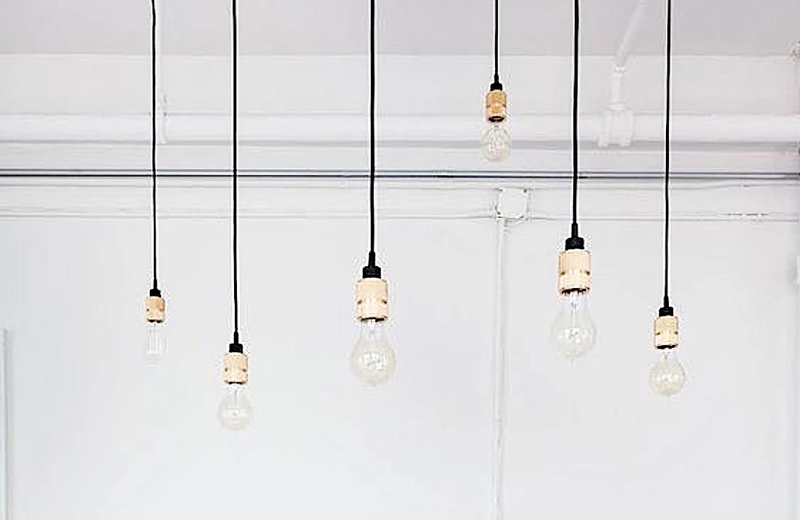 Exposed bulbs have gained some popularity over the last few years and are still holding steading in lighting design. Now with the multitude of different bulbs, including different shaped Edison bulbs it makes it easier to get a great exposed bulb design. The Tara wall scones from Mitzi by Hudson Valley gives a candlestick effect and would be perfect to place on either side of a painting or a mirror above a fireplace. The farmhouse/rustic look has been popular for a few years now and I’m noticing the trend shift a little more towards a more refined rustic look. What I mean by refined is more clean lines. I’m still seeing lots of aged bronze and French iron, and matte black is becoming a popular finish, which fits in nicely with the refined rustic look. 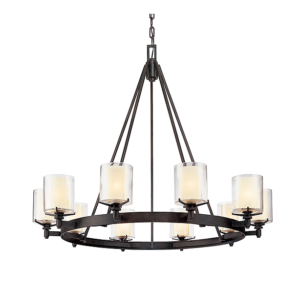 The Arcadia chandelier from Troy Lighting is perfect for over a dining table and pairs nicely with wood tones, leather and shiplap for a perfect refined rustic design. Stay update with Charlotte on her website and Instagram!